LONDON: 21 DECEMBER 2015 - The directors of ECR Minerals plc (the “Directors”) are pleased to announce the publication of the Canadian NI43-101 technical report (the “Report”) in respect of the Danglay gold project in the Philippines (formerly known as the Itogon project). The Report supports the disclosure on 5 November 2015 of an inferred mineral resource estimate for oxide gold mineralization at Danglay. A revised inferred mineral resource estimate is disclosed in the Report and is tabulated below as Table 1. The reasons for the revision are set out below. ECR is the operator of the Danglay project with the right to earn a 50% interest therein, pursuant to an earn-in and joint venture agreement between ECR, Tiger International Resources, Inc. (“Tiger International”) and Cordillera Tiger Gold Resources, Inc. The executive summary from the Report is excerpted below. The full report has been filed by Tiger International, as the party subject to Canadian regulation, on SEDAR (www.sedar.com). The full report is available for download from SEDAR, and will be made available for download today from the ECR website (www.ecrminerals.com). The Report discloses a target for further exploration (the “Exploration Target”), as permitted by NI43-101. The basis on which the Exploration Target has been disclosed in the Report is set out therein, and has been excerpted below. ECR previously disclosed the Exploration Target, in accordance with NI43-101, in its announcement dated 5 November 2015. The following risk warning should be noted with respect to the Exploration Target. A target for further exploration is not a mineral resource estimate, is conceptual in nature, and is used where there has been insufficient exploration to define the target as a mineral resource and where it is uncertain if further exploration will result in the target being delineated as a mineral resource. “The Report includes, in summary form, all material scientific and technical information in respect of the Danglay project as of the effective date of the document, and the Directors hope that the Report will help ECR shareholders, potential investors and any other interested parties come to a more detailed understanding of the merits of the project. The Report makes detailed recommendations for further exploration at the Danglay project, with a budget of US$775,000. The Directors are considering the extent to which these recommendations may be implemented by ECR, and a further announcement will be made in due course. An inferred oxide gold mineral resource estimate with respect to the Danglay project was disclosed on 5 November 2015 with an effective date of 24 October 2015, and is tabulated below as Table 2. This was a ‘global’ mineral resource estimate with respect to oxide mineralization at the Danglay project. During the process of completing the Report, three areas of oxide mineralization (known as Danglay Ridge, Hillside and Bito) were identified. In order to better assess the exploration potential of these areas and more effectively plan further exploration, Mr Neil Motton BSc (Hons), MAusIMM (CP - Geology), MSEG, of the consultancy Snapper Resources Ltd (“Snapper”), was asked to estimate the oxide resource for each area as three separate domains. This resulted in the revised mineral resource estimate tabulated below as Table 1. Mr Motton is independent of ECR and Tiger International and is a Qualified Person under NI43-101 for the purposes of estimating the mineral resource, which is disclosed in accordance with NI43-101 and has been estimated in accordance with the requirements of the Canadian Institute of Mining, Metallurgy and Petroleum (CIM) “Estimation of Mineral Resource and Mineral Reserves Best Practice Guidelines” and the JORC Code. The key assumptions, parameters and methods used in the preparation of the above tabulated resource estimate are disclosed along with other items required under NI43-101 in the Report. The mineral resource estimate is disclosed at a cut-off grade of 0.75 g/t gold. The basis for the selection of this cut-off grade is set out in the Report. Figures have been rounded to reflect the relative accuracy of the estimate. Mineral resources are not mineral reserves and do not have demonstrated economic viability. There is no certainty that all or any part of the mineral resource will be converted into a mineral reserve. Exploration Alliance Ltd (“EAL”) was asked by ECR Minerals plc (“ECR”) to produce a National Instrument 43-101 (“NI43-101”) compliant technical report supporting the disclosure by Tiger International Resources, Inc. (“Tiger International”) of a mineral resource estimate for the Danglay gold project in the Philippines. The oxide mineral resource was estimated by Mr Neil Motton of the consultancy Snapper Resources Ltd (“Snapper”). The Danglay project is covered by Exploration Permit (“EP”) 006-2011-CAR, which comprises 330 contiguous hectares, and within which is situated an exploration prospect known as the Danglay gold prospect. The EP was issued to a Philippine corporation named Cordillera Tiger Gold Resources, Inc. (“CTGR”), which is 100% beneﬁcially owned by Tiger International, on the 15th February 2011 for an initial two-year exploration period. The EP was renewed with a date of 1st October 2013 for a further two-year term, which expired on 30th September 2015. Application for renewal of the EP for a third two-year exploration term has been made. After expiry of this third exploration term, the EP may be renewed for an additional two years for the purpose of completing feasibility studies and making application for a mining licence only (as opposed to further exploration). ECR holds the right to earn up to a 50% interest in CTGR, pursuant to an earn-in and joint venture agreement between ECR, CTGR and Tiger International, dated the 26th April 2013 (as amended). ECR has been the operator of the Danglay project, through CTGR, since the commencement of the earn-in on the 6th December 2013. The Danglay project is located in the Republic of the Philippines on the northern island of Luzon. It is approximately 14 kilometres to the southeast of Baguio City and lies within the proliﬁcally gold-copper mineralized Baguio District. The project has a history of artisanal mining which currently continues on a very small scale—local miners extract weathered and oxidized quartz veins from a series of near surface shallow adits and process the material onsite using very small scale mills, and rudimentary gravity and cyanide leach recovery techniques. Benguet Exploration reviewed the prospect in the 1960s by driving two exploration adits. Subsequently, limited drilling was completed by BHP Engineering Pty Ltd (Australia) on behalf of New Australian Resources N.L., which allowed the estimation of an oxide gold resource. Limited bench-scale metallurgical testing was also completed. In 1996 Placer Paciﬁc Exploration, Inc. conducted limited exploration and estimated an oxide resource using BHP’s data. Several other entities/groups have visited the property and completed reports as outlined in Section 5 of this report. Primary mineralization at Danglay is of an intermediate sulphidation type comprising multiple steeply-dipping, quartz-sulphide-base metal sulphide veins and breccias, and associated quartz-vein stockwork and silica-clay pyrite selvages. Weathering and oxidation of primary mineralization, and pyrite in wall rocks, has resulted in development of an oxide (supergene) gold blanket. To date three mineralized zones have been deﬁned: Danglay Ridge, Hillside and Bito—with cumulative strike length of approximately 600 metres and individual widths of up to 100 metres. 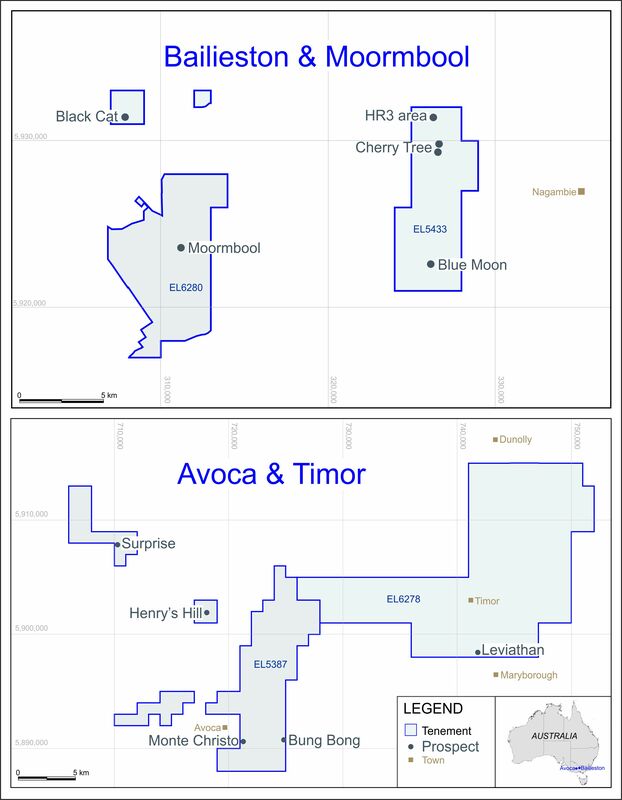 Since commencing ﬁeld work in January 2014, ECR have completed a well-designed exploration program comprising a prospect-wide topographic survey, 935 metres of surface channel sampling, 383 metres of underground channel sampling, 440 metres of trench sampling, 30 geochemical test pits, and 1812 metres of angled RC and diamond drilling. The work was completed to a high standard and, based on the methodology outlined in Section 13 of this report, has enabled the estimation of an inferred oxide gold resource of 1,277,500 tonnes at a grade of 1.55 g/t Au for 63,500 ounces using a cut-off grade of 0.75 g/t Au—the resource estimate is effective the 18th of December 2015. Approximately 80% of the resource estimate comprises in situ oxide material and the remainder comprises talus that has moved downslope to some extent. The inferred oxide resource estimate deﬁnes a broadly ﬂat-lying zone that was modelled from surface to a maximum depth of approximately 20 metres—drill core logging indicates that oxidation may extend downwards along quartz veins and siliciﬁed structures to depths of at least 40 metres, suggesting that potential exists to extend the oxide zone deeper, subject to the results of further drilling. Possible strike extensions may also exist between the Danglay Ridge, Hillside and Bito zones, which will require drill testing. In addition to estimation of an oxide resource, ECR requested that the author provide a target for further exploration with respect to primary mineralization at the Danglay prospect. On the basis outlined in Section 15 of this report, a lower bound target for further exploration was estimated at 600,000 tonnes at 5 g/t Au (95,000 contained ounces of gold) and an upper bound target was estimated at 700,000 tonnes at 7.5 g/t Au (170,000 contained ounces of gold). Targets for further exploration are not mineral resource estimates, are conceptual in nature, are used where there has been insufficient exploration to deﬁne the target as a mineral resource, and where it is uncertain if further exploration will result in the target being delineated as a mineral resource. The intermediate sulphidation epithermal vein deposits of the Baguio District have been mined over 100s of vertical metres and giant deposits such as Antamok and Acupan have been mined over vertical intervals of approximately 600 to 800 metres. Most production has come from quartz-pyrite-base metal sulphide veins and breccias with lesser production from carbonate-sulphide-base metal sulphide veins (for example the Sangilo deposit). High and bonanza grade shoots occur within the broader vein architecture and are important contributors to overall mined grade. Rock chip grab samples taken by the author at the Danglay prospect indicate that some parts of the veins, breccias and siliciﬁed structures are strongly gold-silver-base metal mineralized—a signiﬁcant number of samples assayed above 15 g/t Au and a small number assayed above 100 g/t Au. Silver grades of 5-15 oz/t and base metal grades of between 1-2% zinc and up to 1% lead were also noted. The highest grade sample assayed 142 g/t Au, >16 oz Ag, >2% Zn, > 1% Pb and 0.31% Cu. These grades indicate that high to bonanza grade shoots are potentially present. This is consistent with the results of several ECR drill holes which intercepted signiﬁcant grades over widths typical of intermediate epithermal sulphidation veins in the district. Veriﬁcation rock chip grab sampling by the author also conﬁrmed the widespread presence of oxide gold mineralization within the weathered zone above the primary sulphidic system, with grades of a similar or better tenor than those used to estimate the inferred oxide resource. The styles and grades of primary mineralization at the Danglay prospect, presence of low iron sphalerite, and overall texture of veins and breccias, suggests that the intermediate sulphidation system at Danglay has only been eroded to the top of the quartz-sulphide-base metal sulphide interval—indicating robust exploration potential at depth. Further angled diamond drilling is recommended in order to test the primary mineralization within the Danglay Ridge, Hillside and Bito zones. Understanding structure is key to successful exploration, since structure has exerted a fundamental control on vein formation, and post-mineralization faulting has disrupted, and in part terminated, primary mineralization. Drill holes should be designed to initially target the shallow down-dip extensions of the higher grade vein and structural zones. Quartz-pyrite-base metal sulphide vein breccias, and the intersection points of multiple veins, are considered especially prospective. The proposed budget for inﬁll drilling, metallurgical testwork and further resource modelling of the oxide zone is USD 375,000 and for further geochemical sampling, structural mapping and further scout drilling of the primary sulphide mineralization is USD 400,000. Based on the extent and grade of outcropping mineralization, the style of mineralization and its similarities to other deposits in the Baguio District, and the exploration potential demonstrated by the exploration works completed to-date, ECR requested that the author discuss a target for further exploration in respect of the primary intermediate sulphidation vein-hosted mineralization below the inferred oxide gold resource. The potential target for further exploration at the Danglay prospect includes the Danglay Ridge, Hillside and Bito mineralized zones. The basis for estimation of the lower bound and upper bound targets for further exploration is outlined below. Vein Width, Length and Vertical Extent: To date three mineralized zones have been identiﬁed at the Danglay prospect which collectively have sufficient surface footprint to host multiple veins up to 225 metres long. The Danglay Ridge zone has an outcrop and surface geochemical footprint of approximately 175 metres by 100 metres, the Hillside zone has a surface footprint of approximately 250 metres by 100 metres, and the Bito zone has a strike length of approximately 200 metres and is up to 100 metres wide. Limited RC and diamond drilling by ECR intercepted gold mineralized veins and structures at vertical depths of approximately 75+ metres and mineralization remains open down-dip. Projecting the vertical extent of mineralization to depths of 100-150 metres is considered reasonable for estimation of a target for further exploration—especially given the vertical extent to which intermediate epithermal sulphidation veins of the Baguio District were mined. The use of vein widths of between one to three metres in the potential target for further exploration is supported by outcrop and intercepts in ECR’s RC and diamond drill holes. Multiple Veins: In determining the target for further exploration at the Danglay prospect, the author set the lower bound target on the basis that eight veins are present and the upper bound target on the basis that 10 veins are present. The distribution of outcropping veins and siliciﬁed structures, and the number of artisanal adits, supports the concept that there are multiple sub-parallel veins within the Danglay Ridge, Hillside and Bito mineralized zones. # ECR002 intercepted 5 metres @ 6.46 g/t Au from 10-15 metres (including 1 metre 21.85 g/t Au from 13-14 metres), 15 metres @ 3.29 g/t Au from 82-97 metres (including 2 metres @ 18.25 g/t Au from 9294 metres), and 17 metres @ 1.57 g/t Au from 101-118 metres (including 3 metres @ 5.45 g/t Au 103-106 metres). # ECR004 intercepted 30 m of near surface oxide mineralization @ 1.63 g/t Au from 0-30 metres (including 2 metres @ 7.1 g/t Au from 0-2 metres and 1 metre @ 6.87 g/t Au from 15-16 metres) and 2 metres @ 9.43 g/t Au from 64-66 metres (including 1 metre @ 11.61 g/t Au from 64-65 metres). The target for further exploration is based on a conceptual model that requires further detailed mapping and drill testing to conﬁrm. As with any conceptual model there are inherent risks—in this case the author considers the major ones to be post mineralization structural complexity, actual grades, and the down-dip and strike continuity of veins. Structural Complexity: There is signiﬁcant evidence that post-mineral 020°-040° trending faults (Section 6.3.2: Structure) either truncate (e.g. the Northern Bounding Fault at the northern edge of the Danglay Ridge mineralized zone) or off set mineralization. The dip of these faults is poorly constrained, and dependent upon dip orientation and sense of fault movement, it is possible that they truncate mineralization at depth. The inability to accurately model 020°-040° fault architecture, or structure in general, with the present dataset should be considered a risk with respect to continuity of mineralization at depth. Similarly, whilst ﬁeld evidence suggests that the Danglay Fault which bounds the Danglay Ridge and Hillside mineralized zones dips steeply to the east, the dip of the fault is poorly constrained and it is possible that it truncates the most westerly veins at depth. Gold Grades: The grades used to estimate the lower and upper bounds of the target for further exploration are based on the assumption that high to bonanza grades shoots occur within the broader vein architecture contribute to the overall grade. Assay results from rock-chip slabs clearly indicate that high and locally bonanza grade gold-silver mineralization is present at surface and in near surface artisanal adits. Several ECR drill holes also intercepted high grade mineralization at depth (Section 9: Drilling). Nevertheless, until further drilling is completed signiﬁcant uncertainties remain with respect to grade and grade distribution, the presence or absence of signiﬁcant high grade to bonanza grade zones, or the true thickness of mineralization at depth. Vein Continuity: In addition to the uncertainties arising from the effects of post mineralization faulting, vein architecture at depth is poorly constrained, and the possibility exists that veins pinch and swell at depth dependent upon controlling structure architecture. Until further drilling is completed, uncertainty with respect to vein architecture remains a poorly quantiﬁed risk factor. epithermal: mineralization produced by near surface hydrothermal fluids related to igneous activity; originally defined as having formed in the range 50-300°C. mineral resource: a concentration or occurrence of diamonds, natural solid inorganic material, or natural solid fossilised organic material including base and precious metals, coal, and industrial minerals in or on the Earth’s crust in such form and quantity and of such a grade or quality that it has reasonable prospects for economic extraction. The location, quantity, grade, geological characteristics and continuity of a mineral resource are known, estimated or interpreted from specific geological evidence and knowledge.